As stipulated for elephants and giraffes, JAZA members do their utmost to avoid bringing in dolphins from the wild, and instead are promoting captive breeding programs. JAZA actively supports Member zoos and aquariums engaged in such efforts to achieve this goal. Last November, JAZA initiated the Aquarium Division to address various topic in aquariums management such as husbandry and captive breeding programs. JAZA also formed the “Dolphin Conference” in the Aquarium Division to facilitate cooperation, e.g. in promoting professional transfers of dolphins for breeding, share techniques of artificial insemination, and organize workshops on caring for young dolphins born in captivity. JAZA believes that promoting good animal welfare and contributing to wildlife conservation are important duties of modern zoos and aquariums. The establishment of the Dolphin Conference is a first step to many future efforts to maintain and improve animal welfare and conservation programs in JAZA Member zoos and aquariums. We appreciate your continued understanding and support. 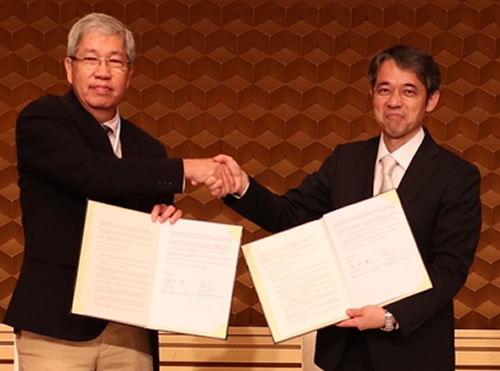 The Japanease Association of Zoos and Aquariums (JAZA) has recently signed MOUs with the regional associations of Thailand and Indonesia to strengthen friendship and mutual cooperation for collaborating in the realms of zoos and aquariums. 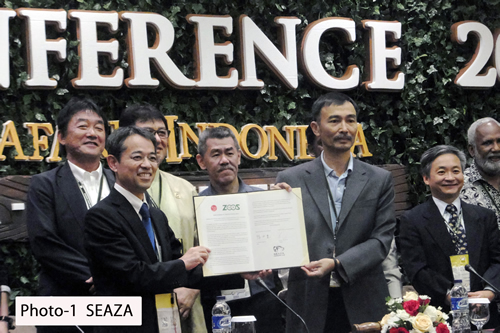 Firstly, at the 20th Species Conservation Meeting held in Sendai on 17th November 2017, JAZA signed a MOU with the Zoological Park Organization (ZPO) Thailand, as well as with the Indonesian Zoos and Aquariums Association(PKBSI) on 18th May 2018, at the 2018 JAZA conference held in Kagoshima. The MOU is aimed at working together to solve common problems for the mutual development of all regional zoos and aquariums associations in the Asian region. JAZA has concluded similar memoranda with the Chinese Association of Zoological Gardens (May 1990), South East Asian Zoos and Aquariums Association (November 2016) and Korean Association of Zoos and Aquariums(December 2016). As of now, JAZA has concluded MOUs with five regional associations. We hope that all regional associations will work together to solve problems that can not be done by one association only, so that the road to effective solutions can be achieved. Above: Dr. Fukuda, JAZA Chair(left) and Dr.Ratanakorn, ZPO Chairman(right). 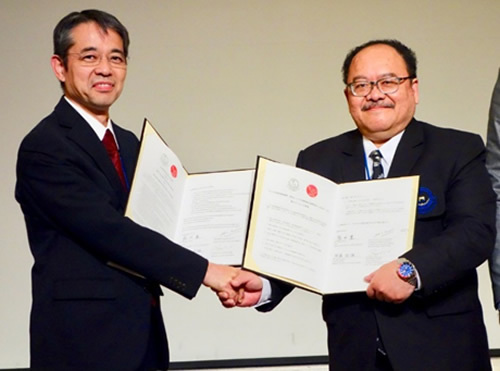 Below: Mr. Sumanpau, PKBSI Secretary General(left) and Dr. Fukuda, JAZA Chair(right). The Japanese Association of Zoos and Aquariums (JAZA) is deeply engaged in and committed to realizing species-appropriate animal care that also meets individual needs in compliance with the Act on Welfare and Management of Animals. This holds true for elephants. To ensure optimal welfare we believe that elephants should be cared for and housed in a meaningful group context, as they are highly social animals and their communicational and physical interactions among individuals are essential to welfare. However, currently several Japanese institutions are caring for singly-housed elephants. We are committed to review the needs for each individual elephant to assess and determine what is in his or her best interest. JAZA members will strive to transfer and integrate singly-housed elephants to a group structure where possible. Some elephants who have lived alone for a very long time might need longer habituation time to new and different environments, as well as social companions. Novelties can cause unnecessary distress, which we can prevent by considering the individual’s best interest. By observing behavior and interactions, as well as considering their individual character, we intend to slowly integrate many of the singly-housed elephants. The elephants in singly-housed environments shall be provided with extensive environmental enrichment programs, offering choice, control, and complexity. We are committed to improving the welfare of elephants and appreciate your continued understanding and support. In order to further the agreement reached through September meeting on the coalition of regional zoological associations in Asia, Dr. Yutaka Fukuda, chair of JAZA, attended the annual conference of the South East Asian Association of Zoos and Aquariums (SEAZA) in Bogor, Indonesia in November 2016. Taking advantage of this opportunity, Dr. Fukuda and SEAZA president Dr. Phan Viet Lam agreed and signed, on 3 November, a Memorandum of Understanding for establishing friendly relations between the two associations. 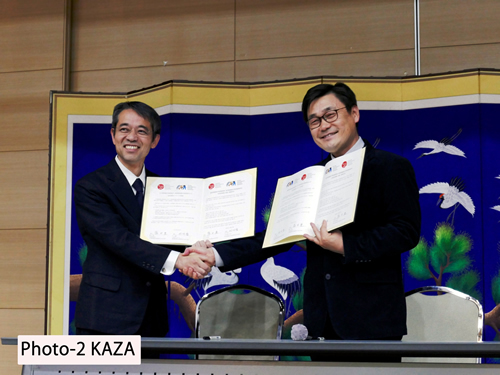 A month later, Dr. Fukuda flew to Chungju, Korea, where the members of Korean Association of Zoos and Aquariums (KAZA) got together for its annual conference, and signed with KAZA president Dr. Kisup Lee a Memorandum of Understanding for establishing friendly relations between the two associations. SEAZA which was born in 1990 now links 70 institutions in 14 countries of the South-east region of Asia. Its members are Brunei, Cambodia, Hong Kong, Indonesia, Laos, Malaysia, Myanmar, Papua New Guinea, Timor-Leste, the Philippines, Singapore, Taiwan, Thailand and Vietnam. As for KAZA, its establishment dates back to 1985, now holds 15 zoos and 5 aquariums in the country. Objectives of signing these memorandums with zoological associations are to establish with every member-country and every member-institution much closer and friendly relations for the species conservation through exchange of animals or breeding loan, for further collaborative work to level-up breeding technique, population management, animal welfare and for pursuing the common interests/targets. Having signed these two new MOUs, which followed May 1990 agreement with Chinese Association of Zoological Gardens, JAZA will make full use of the good relations and cooperative framework with overseas institutions to preserve biodiversity, to improve animal welfare and management and to promote/accelerate community-level Information-Orientation-Communication (IOC) activities. AND AQUARIUMS ALL RIGHTS RESERVED.